23 1ST READER (pointing at the page) "Start right in the middle...the beginning is as trite as the ending." MR. LINCOLN (always affected, ego wise, by his own words begins to read in a grand manner) "I will say, then that I am not, not ever have been in favor of bringing about in any way the social and political equality of the white and black races. That I am not, nor ever have been in favor of bringing or making voters or jurors of Negroes, not of qualifying them to hold office, not to intermarry with white people, and I will say in addition..." 1ST READER "You would." 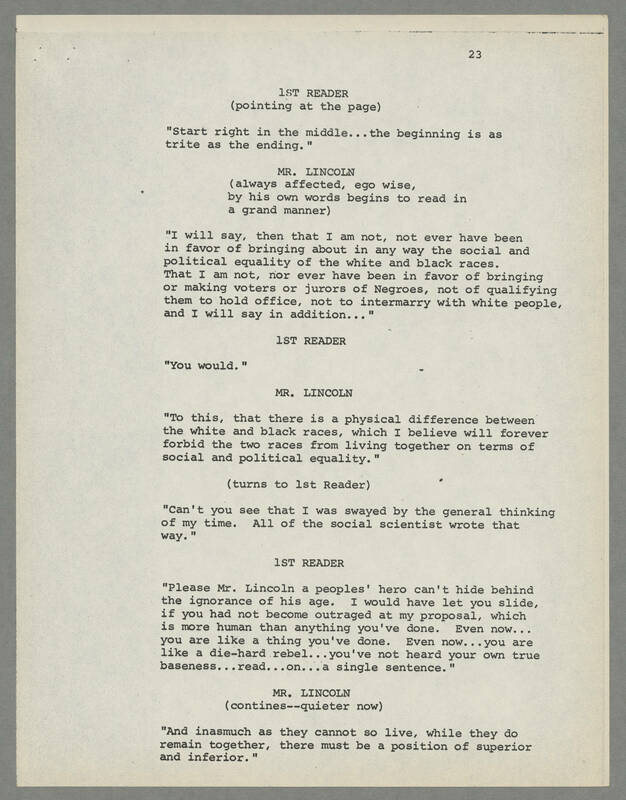 MR. LINCOLN "To this, that there is a physical difference between the white and black races, which I believe will forever forbid the two races from living together on terms of social and political equality." (turns to 1st Reader) "Can't you see that I was swayed by the general thinking of my time. All of the social scientist wrote that way." 1ST READER "Please Mr. Lincoln a peoples' hero can't hide behind the ignorance of his age. I would have let you slide, if you had not become outraged at my proposal, which is more human than anything you've done. Even now...you are like a thing you've done. Even now...you are like a die-hard rebel...you've not heard of your own true baseness...read...on...a single sentence." MR. LINCOLN (contines--quieter now) "And inasmuch as they cannot so live, while they do remain together, there must be a position of superior and inferior."